It has come to my attention that, recently, a few lucky anglers have been having way too fun experiencing what might just be the rarest catch of all - broadbill. This may be because, the "sunning" broadbill which are spotted and targeted are most likely resting at the surface, in the warm water to help digest their meal from the previous evening. Swordfish feed mainly at night you see and are, therefore, reluctant to scurry around after bait in broad daylight. The few fish that are successfully "baited" are, and should be, highly prized. Here is a brief summary of what we know about this magnificent billfish. DISTRIBUTION - Worldwide in tropical and temperate waters. 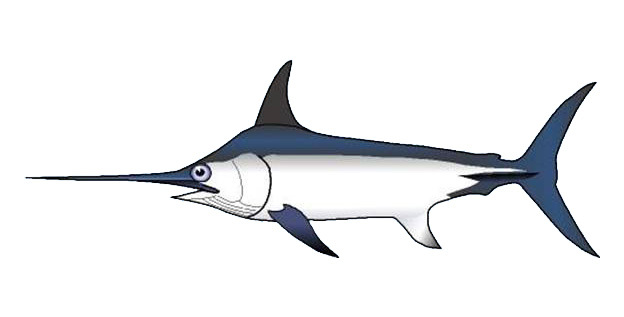 Off the west coast of North America, swordfish have been taken as far north as Vancouver Island, but are most common from Pt. Conception south. California broadbill probably migrate up from Baja California in the summer and fall, and return to Baja in the winter. Swordfish are deep divers. Although they probably spend most of their time between the surface and 400 feet, they are known to make dives to depths of 2000 feet. SIZE & AGE - To 15 feet and 1,182 pounds. An average broadbill is about 250 pounds and females grow larger than males. Swordfish live at least 9 years, but little is known about their age-growth characterisitics. DIET - Squids, sardines, anchovies, sauries, and bottom fishes. REPRODUCTION - Broadbills may mature at around 3.5 feet (eye to tailfork length), but no one really knows. Female swordfish produce up to 6 million eggs per season. Spawning occurs in the western, central, and southern portions of the Pacific Ocean. Off of Hawaii swordfish appear to spawn from April through July. FISHERY - Off Southern California, very few sport anglers ever manage to catch a broadbill. Worldwide, swordfish are an extremely important commercial fish, taken by long line, gill net, and harpoon. Since 1980, California commercial landings have ranged from 1 to 5 million pounds per year.